I am new to SuperLab and would highly appreciate your inputs on the following. I am planning to conduct an experiment in which participants have to provide answers to several questions via keyboard-string input. Then they do something else and later on in the experiment I would like to display the answers provided earlier and ask them to elaborate (i.e. provide new keyboard-string input). Is it possible to retrieve the answers typed in earlier from the saved output file and display it in a new event window? 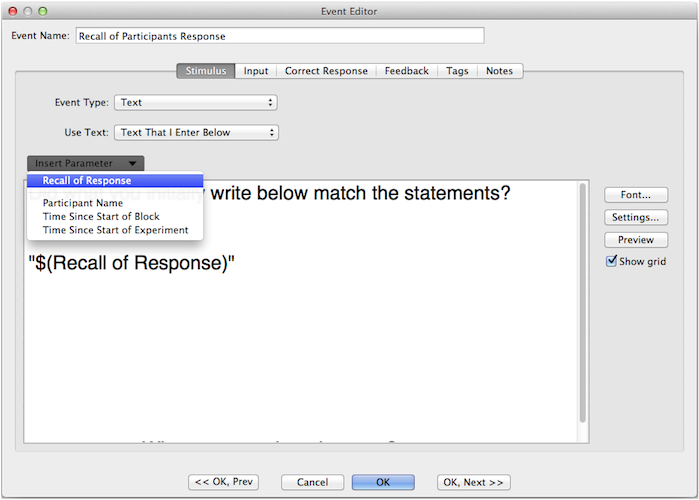 No, unfortunately SuperLab cannot retrieve and display the answers within the experiment. I will make sure to let the developers know about this feature request. This feature is now available with the new release of SuperLab 5. Below is an image that demonstrates how this is implemented in SuperLab 5. Last edited by MonikaT; January 2nd, 2014 at 10:26 AM..